Light up the night with our new RBP Midnight Edition Grilles. The Midnight Edition Grilles feature an all black design that will guarantee your truck will be the envy of all of your friends. Made using the highest quality of 304 stainless steel, and features two black single row LED light bars, the Midnight Edition Grille will catch attention everywhere you go. 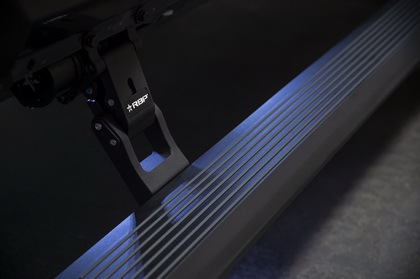 The two 11/5 inch CREE LED light bars feature spot LED beams in the center and flood LED beams at the corners, giving you the ability to light up the night and see everything in front of you. The double woven mesh and RBP iconic studded edging makes for a clean final touch to your ride. Featuring a new, limited lifetime warranty - it means you are covered no matter what.